You can't, unfortunately, buy a beer with leads or clicks to your website. The craziest paradox I see in B2B marketing is when marketers celebrate achieved leads quota while the sales team doesn't hit sales quota. This misalignment leads to ineffective marketing campaigns which generate low-quality leads. At the same time, this ... Más informaciones leads to infamous sales and marketing war when marketers blame the sales team that they can't close deals while sales retort that marketing generates weak leads. The modern B2B marketer should be revenue responsible and take care of sales number or, how Matt Heinz says: B2B marketers can ensure and embrace revenue responsibility through the entire funnel. Even if the lead was generated, marketers can still impact pipeline velocity, help the sales team to close more deals and ensure that leads fit the ideal customer profile. The problem is that not so many marketers are eager to become revenue responsibly and not so many companies have a good environment and culture for this. 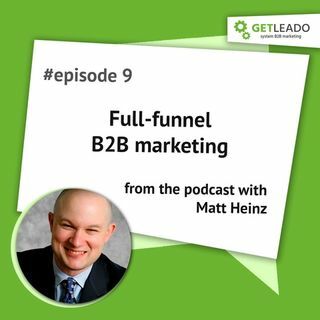 I invited Matt Heinz to share his thoughts on how to leverage full-funnel marketing and how to set up revenue-responsible marketing culture. * The right way to align sales and marketing teams around your strategy and around outputs instead of inputs, and coordinate sales and marketing activity to close more deals in less time?